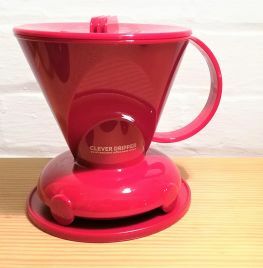 This is the new Red version of the small Clever Dripper with 300ml capacity for 1 expertly brewed coffee. The name says it - this is really clever! Great fun to use, and a great way of making good coffee. Uses a filter just like the V60 but has a trick up its sleeve. Place the Clever dripper on your worksurface , add the filter, coffee and water stir and then pop on the lid. Let it brew for 3 minutes then pop on top of your favourite mug. The innovative valve releases the coffee as its placed on a mug or server. Then lift off and the flow stops immediately. Comes with a handy coaster to collect any rogue drips. Your first 100 filters are included in the box. How about Adding a Coffee Grinder?